Following on from last week’s news of a $1 million price cut on his central listing Atlantica, Bob Cury at RJC Yacht Sales sends word of a similar reduction on another central agency, the 37.8m motor yacht Aquasition. Built in 2008, this Broward raised pilothouse yacht represents the newest and most highly customized Broward built in the company’s 50-year history. Aquasition is built to full Lloyds, Maltese Cross 100A1 classification and has completed two transatlantic crossings. Her custom interior, created by Genesis of Viareggio, features high gloss cherry woodwork, elegant Madagascar ebony wood furnishings, cashmere silk blend and suede upholstery throughout. Her five-stateroom layout includes a large on-deck master with his and her marble onyx bath along with four spacious guest staterooms below. 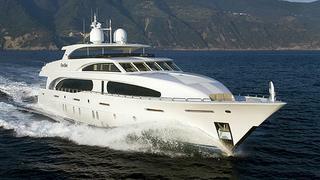 In addition, she features full walk-around decks, an oversized aft deck and flybridge with hardtop, bar and Jacuzzi. Powered by twin MTU 16V-2000 engines, she cruises comfortably at 20 knots and is equipped with zero speed stabilizers. Aquasition is now down from $9,995,000 to $8,995,000 and will be featured at the RJC Yachts display located at Hyatt/Pier 66 during next month’s Ft. Lauderdale Boat Show.